UK Asian Film Festival (March 27-April 7) – are you ready? IT WON’T be long now before you’re poring over the listings for the UK Asian Film Festival – March 27 to April 7 – make a note in your diary and make sure you’re connected to both the UK Asian Film Festival (UKAFF) and http://www.asianculturevulture.com on social media to get the most of the films and special events coming your way. We are the digital partners of the UK Asian Film Festival and have been since 2017. Remember the festival is a nationwide affair and films will screen in Edinburgh, Glasgow, Leicester, London and Manchester. You’ll hear important announcements about the festival here and we will be carrying interviews and stories in the run-up to the festival, during and after, so do not miss out! Follow us in whatever way you want… and in real time (see links below). We’ve got experience of covering festivals from Cannes to the International Film Festival and Awards Macao (IFFAM) which is only three years old and to which we were invited to attend last year – December 8-14. We have a team of presenters and journalists who will be help to enhance your viewing both at UKAFF and some of the other large festivals closer to home. You can see our other festival coverage by clicking on our festivals tab on the home page. Look out of the next international festival, which starts this very week 😉 ! 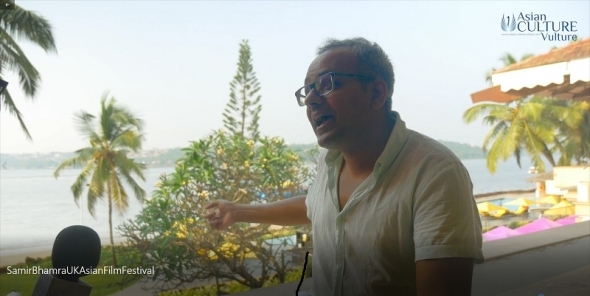 We were able to catch up with UK Asian Film Festival creative director Samir Bhamra in Goa last year at the trade section, Film Bazaar, which is one part of the International Film Festival of India (IFFI). Expect a strong line up as Bhamra discusses what impressed him as he sourced films for this year’s UKAFF and what sort of themes have emerged from new films over the last year or so from the region.